I am a new blogger. For a long time now, I have been thinking about blogging my recipes, but never did it. Earlier this month, inspired by a friend, I created my first blog!! Originally I planned to post all my recipes also there. But then I discovered that in food blogging, there were many events every month. That was so exciting!!! So, I took the plunge! JFI-Soya is the first event I am participating in. Sia, here's a vegetarian dish cooked specially for this event!!! 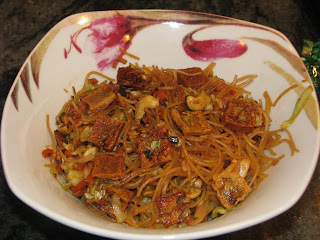 Till I tried this dish, I wasn't a huge fan of soya, but I am making this for lunch tomorrow for my husband!!! I made another tofu dish this afternoon, Tofu Bites, but they lacked a "bite". I made this from the left over tofu and other veggies in the fridge - sort of took a few items and tossed them together and was pleasantly surprised by this zesty dish!!! Put a paper towel on a cutting board & place the tofu slab on it. Put another paper towel on top of the tofu. Place a heavy skillet upon this. This helps drain the water from the tofu. Keep aside. Chop the cabbage & carrots. Mince the ginger, garlic & chili. Keep separately. Remove tofu from the paper towels. First cut the tofu slab in half and then into bite sized bits. Make them thin. I had about 20-25 bits. Heat 1/2 the oil in a non-stick skillet. Add ginger, garlic & chili and saute till the garlic starts turning brown. Add cabbage & carrot. Keep tossing till the cabbage turns brown. Add cashews & chili flakes, toss another minute. Empty into a bowl. In a sauce pan take enough water to cook the noodles. Add a little salt (just a pinch) & bring to a boil. Add the noodles and simmer till the noodles are done. 2-3 mins for al dente. Strain and wash noodles in cold water. Heat the rest of the oil in the same non-stick skillet. Add the tofu. Give the pan a good shake to spread the oil across all tofu pieces. Cook till both sides are a nice golden brown. Takes about 3-5 mins. Sprinkle the sugar over all the tofu pieces. Let the sugar caramelize. Toss a little to coat the tofu pieces with the sugar. Add soya sauce & spring onion. Cook another minute. Add cooked vegetables & noodles. Simmer and cook for 2-3 mins. Empty into a bowl & enjoy your meal!! If you'd like chunkier pieces of tofu, don't cut the whole slab in half. Sprinkling some ground peanuts on top will be a nice addition. This dish is also going to Lore of Culinarty who is hosting Original Recipes Event. Here's the round up of the JFI-Soya event. An amazing 86 recipes!!! thank you lore!!! very nice event you have going! !